This week in pubs has been a little busier than I might have anticipated, given the devastation visited on my insides by last week‘s stag weekend in Brighton. It begins on Tuesday night, at the Rutland Arms (featured here), a desolate, down-at-heel boozer on the back streets of Grimsby and the back streets of life. This particular Rutland Arms, as regular readers will know, is where I go before I go to the football. Why choose such a downbeat location? Well, after an hour or two in the Rutland Arms, even Blundell Park seems cheerful. 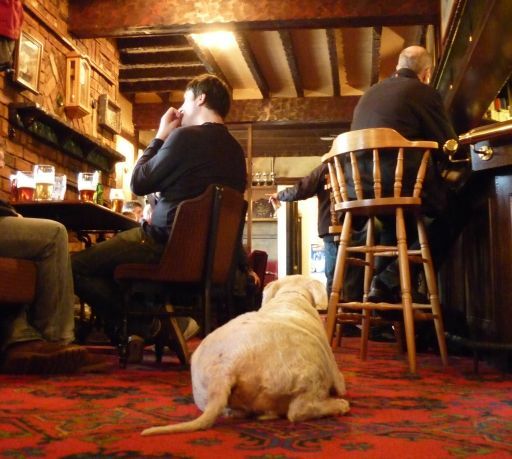 As well as that, the Rutland has a unique selling point: you can sit down and have a chat. The places nearer the ground are too busy and too noisy to do this. Tonight, however, the pub’s new managers are continuing their project to drive away the few punters who remain, by trying to make it the same as everywhere else. In one way, of course, their enthusiasm is admirable. But you can’t help thinking that if keeping the pub alive were as simple a matter as turning the jukebox up to 11, then this solution might have been chanced upon already by one or more of the Rutland’s 94 previous managers this year. It’s also pretty funy to hear a jukebox turned up to 11 playing ‘Those Were The Days’ by Mary Hopkin. On Thursday there’s lunch at the West End. Pretty good it is too. The chef even comes out to talk to me after I’ve asked the barman about the ingredients. My brother pays a visit in the evening, so we head up the hill towards Crookes and the Princess Royal. I like how the music quiz here doesn’t start until 10pm: this way it doesn’t dominate the evening. Jon and I team up with a late-middle-aged couple, and I amaze all present by knowing which sport the singer out of Iron Maiden once won a bronze medal for. There is, of course, more than one Rutland Arms in the world. The next day I pass an agreeable hour and a half in a really good one. I’m on my way to play a gig in Manchester, but first I’m having a few pints of excellent pale ale with some pals in Sheffield’s Rutland Arms (featured here, pictured below). It’s a very fine pub at any time of day or night, but there’s something about Friday after work that just fits it perfectly. 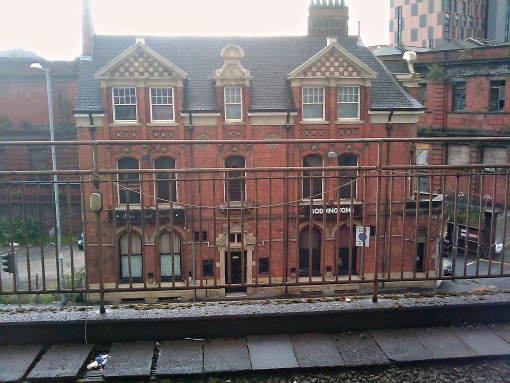 At the other end of the Hope Valley Line is the place I’m playing at: the Star & Garter, just outside Piccadilly station. It’s quite a famous small venue, on the indie circuit, for gigs and club nights. But it’s my first visit. And it’s by no means certain how to get in. The place is all dark and looks closed. Normally, at a moment like this, all my resourcefulness and independence of spirit would come right to the fore, and I’d give up and ask someone else. Tonight, though, I’m playing solo. 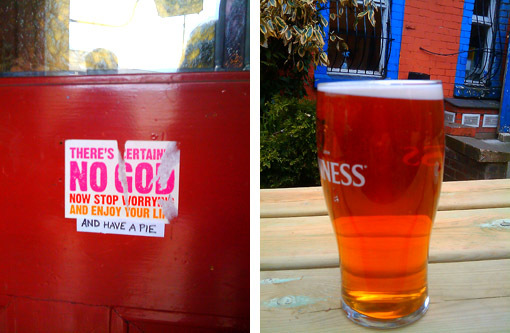 So, when the pub looks dark and empty and the door looks locked, I check round the back. No use. Back to the front. I’ll knock. Someone must have been watching me on CCTV. Someone who has spent their whole life mastering and perfecting the withering, poker-faced, and utterly deadpan sarcasm that folks from these parts have down more finely than any other people on the planet. “Walked right round the pub twice and finally decided to knock on the door. Well done. Glittering career ahead of yer.” It’s the most Manchester moment I will experience in my entire life. Downstairs the Star & Garter has one of those tiled Victorian interiors that can feel a little austere if they haven’t been given much love. This one hasn’t been given much love. The upstairs bit, where the Kissing Just For Practice club night goes on after my set, is smashing though. Manchester never seems to me quite as friendly a place as it likes to think it is, and I feel a bit lost and out of sorts, but two or three exceptionally kind indiepop fans help me through a long, long night. There’s just time for a quick one back at the Princess Royal late on Saturday night, then on Sunday it’s another quiz night, this time at Fagan’s (featured here). As a group of ten friends, split into two teams, we have quite a good night in the quiz and an excellent night in the pub. Towards the end of it, one incident sums up why both are excellent. Denied a perfect score of 20 out of 20 by a spelling mistake, our team is ready to settle for second place. Then the winners, seated at the next table along, lean over and express their disapproval of the strict marking. A spelling mistake? So unfair. They hand us half of the free pint vouchers that are their prize, and they won’t let us say no. My teammate Sarah provides the perfect summary of this event and the perfect last word for this week in pubs. Sarah’s wife Chella is responsible for The Venns, a sort of zine/comedy/pub quiz research project (if you like Get to the pub.com, you’d love it). “Chella’s going to love hearing about this!” says Sarah. “It’s everything about pub quizzes and pubs and community and Sheffield, in a nutshell!” And nothing can be added to that. I’ve looked down from that platform at the Star & Garter many times, the only punters I ever saw were some very frightening looking proper skinheads. If I’d have gone in I don’t think my Fred Perry would’ve saved me.